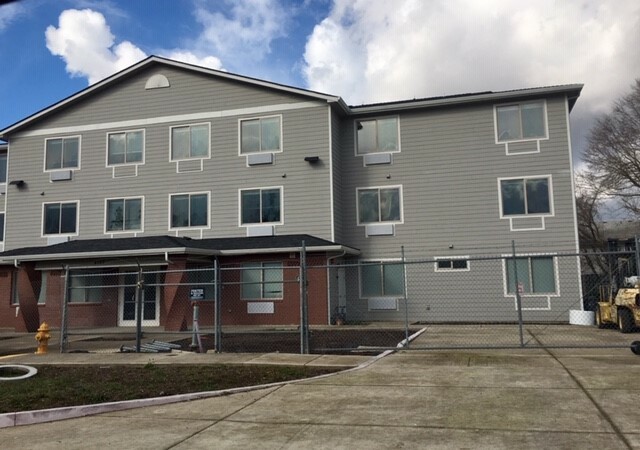 The Salem Housing Authority landed a new property this week to transform into the city’s debut “housing first” facility, set to open by fall. Redwood Crossings, at 4107 Fisher Road N.E., will be a 35-unit apartment complex and will give tenants in-house access to social services, laundry and a community kitchen. The complex will be open to people making at most $13,700 a year. Rents will either be free or 30 percent of income. “We want to get the doors open. More people need the help,” said Nicole Utz, acting administrator for the housing authority. There will be vouchers available for 29 standard rooms, Utz said, and she expects those to go quickly. Six rooms are medical respite units for people who are ill.
Utz said the application process won’t start until an opening date is set. Construction starts late June or early July. The nearly 20,000-square-foot building is mostly built-out. It was planned to be assisted living facility, but never finished, said Utz and Urban Development Director Kristin Retherford. Construction could take 60 to 90 days. “Of course there’s urgency. We need more and more affordable housing every day,” said Utz. The new complex will give preference to homeless and Latino populations, according to Utz and Retherford. City officials said the North Gateway Urban Renewal Area is 81 percent Latino. Housing first is a growing model across the country, homeless advocates say. The idea is to house “hardest to house” people in the same building where social service providers work, so people are close to jobs training, financial aid and more. It’s unclear which social service providers will work at Redwood Crossings. Utz said they are in negotiations. The housing authority bought the building for $530,000, mostly with federal grants, from the Urban Renewal Agency. The agency had bought the property last fall for $1.5 million, mostly using North Gateway urban renewal dollars. Retherford told Salem Reporter at the time that the agency sold at a $1 million discount because Redwood Crossings would help meet the city’s overarching goals of helping the homeless.